The Vermont Avenue Jetty was famous for being where the world record striped bass was caught. 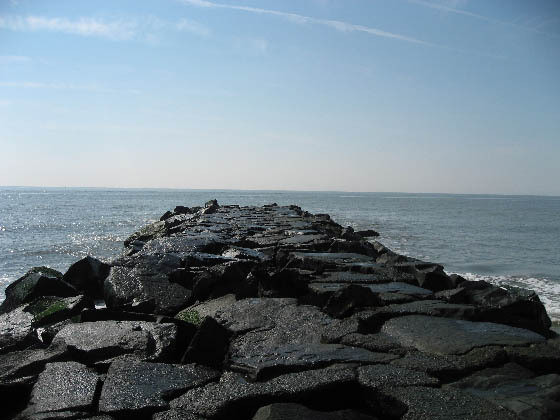 The previous world record striped bass was caught off of this Atlantic City jetty by Albert McReynolds in 1982. It weighed 78 pounds and 8 ounces. 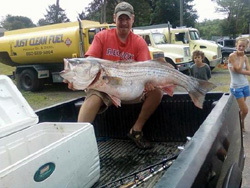 This record stood for 29 years, however in 2011 an even larger striped bass was caught in the waters off of Connecticut. A new world-record striped bass was caught on the night of August 4, 2011 in Connecticut waters. The striper was boated by Greg Myerson and was weighed in at 81.88 pounds. it edges out the previous record of 78.8 pounds caught in 1982. Greg Myerson's striper became the official world record when it was certified by the IGFA on Oct. 19th, 2011. Now the Vermont Avenue Jetty is not as famous as it used to be. In 2008 there was an article in The Fisherman magazine about Al McReynolds, and his world record striped bass that he caught off of the Vermont Jetty in Atlantic City. The article stated that Al caught his world record 78.8 pound striper on a Rebel Windcheater plug. Other places I had read that Al caught his fish on a 5½ inch Rebel plug. I knew that a Rebel Windcheater was 6½ inches long. The magazine article also said that Al, every year on the anniversary of his record catch, went to Atlantic City and visited the Vermont jetty where he caught his striper. To resolve the plug length issue, I decided to go find Al and ask him. Early in the morning of the anniversary of Al's catch, I went to the Vermont jetty. I hung out there all day waiting for Al. He never showed. However, I talked to numerous fishermen and others who came by the jetty that day. None knew for sure which plug Al had used. Two different people explained to me how Al landed his striper. One said he climbed off the jetty and landed it on the beach to the north of the jetty. The other person also said Al climbed off the jetty, but landed it on the beach to the south side of the jetty. Another view of the Vermont Avenue jetty in Atlantic City. This jetty is just north of the Showboat Casino.